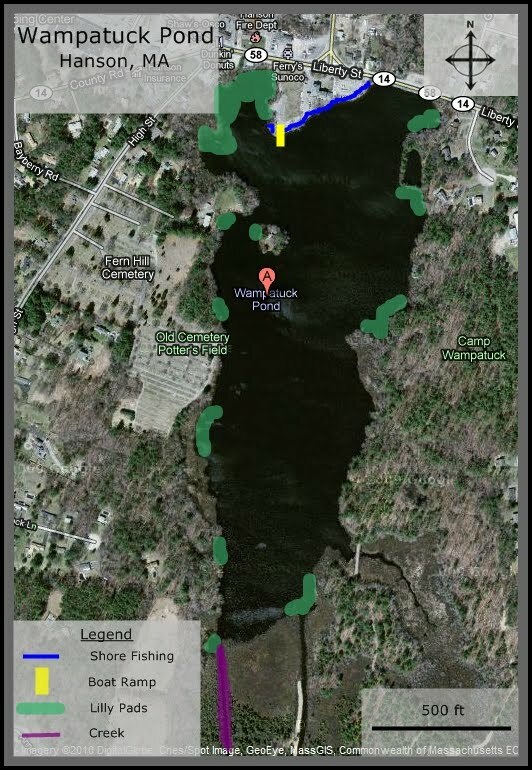 Wampatuck Pond is just one of seven or eight ponds within a 4 mile radius in Hanson, all of which I plan to fish soon. I spent about 6 hours out on Wampatuck in early June with a friend of mine and we pulled in 16 bass but not a single one over a pound. It's a good size pond with a lot of variation as far as depth, forage, current, and sun exposure. There is a public boat ramp with plenty of parking located off of Liberty St, aka Route 58, aka Route 14. To the right of the boat ramp you will find a section full of lilly pads. Unfortunately, it is just a little too shallow to fish if the water gets too warm. Straight out from the boat ramp is a small island where, on the northern shore, we caught several bass. When facing the island, to the right you will find a little cove with a patch of lilly pads and a couple over hanging trees where we again caught 2 or 3 bass. If you travel all the way down to the southern end of the pond, you will find a little cove that has bushes that run into the water which will produce a few bass. More interestingly though, there is a little creek that stretches about .2 miles down to what I believe is a rock quarry. The creek is about 8 feet wide and 3 feet deep but we were catching bass about 300 feet into the creek. It's an interesting little spot to fish if you have a boat. In the southeastern corner of the pond, you will find a little cove that is really protected from the rest of the pond. We caught about 5 bass here including our biggest ones. As you drift up the eastern shore, there are lots of trees overhanging and little patches of lilly pads that you can work as you make your way back to the boat ramp. Overall its a good little spot for fishing but I we couldn't seem to land anything impressive. I think the larger ponds in that area will be the place to find the lunkers.